American DJ D6 Branch WiFly DJParts - All Variety of Parts that DJ Needs. 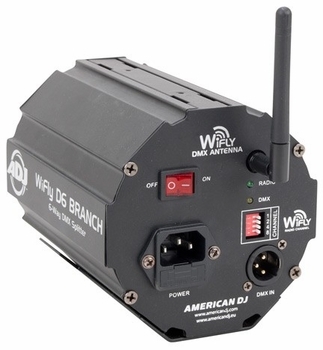 The WiFLY D6 Branch is a 6-way wireless DMX Splitter/Amplifier with ADJ’s WiFLY Transceiver built-in. Each output is electrically and optically isolated from the input, and from every other output by optical couplers. It makes running DMX cable to lighting fixtures easier and more efficient. It features one DMX Input, 6 DMX Outputs and 1 DMX Thru. The WiFLY D6 Branch also includes two Velcro straps and a clamp-mounting bracket. Specifications: • 6-Way DMX Splitter/Amplifer compatible with ADJ’s WiFLY Wireless DMX built-in • 1x DMX In, 6x DMX Out & 1 DMX Thru (all 3-pin XLR’s) • Link with other WiFLY D6 Branch Splitters • Input & outputs are electrically and optically isolated from each other • Includes 2x Velcro straps to securely attach to truss • Clamp mount bracket included • On/Off power switch • Multi-voltage operation: AC 100-240V, 50/60Hz (IEC Socket) • Dimensions (LxWxH): 6” x 4.75” x 4.75” / 150 x 120 x 120mm • Weight: 4 lbs/ 1.45 kg.